I have often reflected, wistfully, on how much happier modern history might have been had Hitler been brought up as an atheist, an agnostic, or, at least, a Unitarian. Born and bred a Catholic, he grew up in a religion and in a culture that was anti-semitic, and in persecuting Jews, he repeatedly proclaimed he was doing the "Lord's work." You will find it in Mein Kampf.- "Therefore, I am convinced that I am acting as the agent of our Creator. By fighting off the Jews, I am doing the Lord's work." Hitler said it again at a Nazi Christmas celebration in 1926: "Christ was the greatest early fighter in the battle against the world enemy, the Jews . . . The work that Christ started but could not finish, I--Adolf Hitler--will conclude." Hitler regarded himself as a Catholic until he died. "I am now as before a Catholic and will always remain so," he told Gerhard Engel, one of his generals, in 1941. 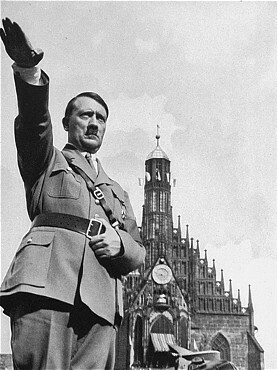 When Hitler narrowly escaped assassination in Munich in November, 1939, he gave the credit to providence. "Now I am completely content," he exclaimed. "The fact that I left the Burgerbraukeller earlier than usual is a corroboration of Providence's intention to let me reach my goal." Catholic newspapers throughout the Reich echoed this, declaring that it was a miraculous working of providence that had protected their Fuhrer. One cardinal, Michael Faulhaber, sent a telegram instructing that a Te Deum be sung in the cathedral of Munich, "to thank Divine Providence in the name of the archdiocese for the Fuhrer's fortunate escape. " The Pope also sent his special personal congratulations! Later the Pope was to publicly describe Hitler's opposition to Russia as a "high-minded gallantry in defense of the foundation of Christian culture. "Several German bishops openly supported Hitler's invasion of Russia, calling it a "European crusade." One bishop exhorted all Catholics to fight for "a victory that will allow Europe to breathe freely again and will promise all nations a new future. " Biographer John Toland wrote of Hitler's religion: "Still a member in good standing of the Church of Rome despite detestation of its hierarchy, he carried within him its teaching that the Jew was the killer of god. The extermination, therefore, could be done without a twinge of conscience since he was merely acting as the avenging hand of god - so long as it was done impersonally, without cruelty. Himmler was pleased to murder with mercy. He ordered technical experts to devise gas chambers which would eliminate masses of Jews efficiently and 'humanely', then crowded the victims into boxcars and sent them east to stay in ghettos until the killing centers in Poland were completed." Jews, of course, were not the only "holy" victims. In Yugoslavia, Hitler installed a Croatian, Ante Pavelic, as his puppet, and Pavelic, a Catholic like Hitler, began extermination of the Serbs, who were Greek Orthodox. One of my relatives by marriage is a Yugoslavian, a Serb, who survived World War II by going "underground" with the advent of Nazism in his country. Out of his immediate family of 17 (this includes his parents, siblings, aunts, uncles and first cousins), only three survived. His mother and sister just disappeared, his mother shortly after being given the opportunity to convert to Catholicism, an offer she refused. The Vatican was not unaware of the massacres conducted in Yugoslavia In the name of Catholicism, but Pope Pius remained diplomatically quiet. In fact, one of his actions was to receive Ante Pavelic in private audience, thereby giving his blessing to this regime. War's causes, of course, are complex, but it would be difficult to overestimate the disastrous role religion played in World War 11. Distrust, fear and hatred of Jews was a lesson Hitler learned early in life. It was taught by his church and reinforced by his culture. It became his obsession, his version of "the Lord's work." That Hitler, that supreme villain of the 20th century, could see himself, and be seen by others, as "providentially" guided, protected and inspired should certainly serve as an ominous clue to the dangers of religious belief. just as the Vatican umbrella could be maneuvered to shield the massacres of Serbs by Catholics in Yugoslavia, so can religion validate any behavior, any atrocity, any war. by Anne Nicol Gaylor., expert from Lead us Not Into Penn Station. It all fits a pattern, nutty beliefs will produce nutty behavior. Hitler's Jewish program, sanctified by God, is just another of many cruel examples. I READ A COUPLE OF MONTHS AGO A BIOGRAPHICAL SECTION FROM MEIN KAMPF ON HOW HE EVOLVED INTO AN ANTI-SEMITE. In it is a very believable account of the events and influences leading up to his anti-Semitism. It is more than biographical, for it is a well structured, logical argument for his anti-Semitism. 1). The Jews were Jews first and Germans second. For a soldier and nationalist, just a few years from the First World War the issue of loyalty was very important. We interned the Japanese during World War II. 2). He became a friend of, and thus under the influence of, the Mayor of Vienna, who was publishing a very anti-Semitic newspaper and lead an anti-Semitic political party. 3). We can stop here in our quest for a cause. Man is a social animal. The Mayor of Vienna was the foundation for his genesis, for going from the popular anti-Semitism to the fervent anti-Semitism. The rest of what he wrote is just verbal justification of his behavior. We could ask why anti-Semitism was the norm. The short answer is that those were violent times where racial, religious, ethnic, and ideological differences were sources for attacks. Consider for example the history of the early Mormons, or the Bloody Reformation, where fully one fourth the population of Europe died in the name of Christ over the period of a century. Look at the treatment of the Irish by the Brits. They stole their land, and when there was the Potato Famine, they would not ship them food. Moreover, the Protestant land lords were shipping food out of Ireland, when it was more profitable. Now consider a people who not only have different religion and beliefs; a people that flout it in their dress and their worship. Moreover, the Conservative and Orthodox Jews separated themselves socially from their Christian neighbors. What happened over the centuries to the Jews fits with the prevalent pattern. What is shocking is not that the machinery of state was brought against the Jews, but rather that it occurred in Germany and in the 20th century. As Kant said, War makes more evil people than it kills.